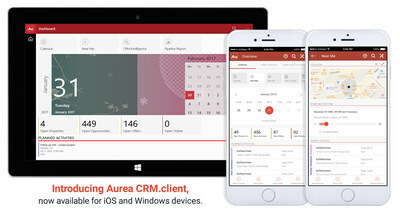 AUSTIN, Texas, July 11, 2018 /PRNewswire/ -- Aurea Customer Relationship Management (ACRM) today announced several product enhancements, including the release of a new mobile app, called Aurea CRM.client. This latest mobility innovation extends ACRM's existing iOS and Windows offerings so customers can seamlessly access essential functionality on the platforms and devices they use most, making it easier to get work done on-the-go through one powerful app. "Studies show companies gain an extra 240 hours of productivity annually from employees using mobile devices. This is why it's especially important to give sales teams full freedom from their desks with bring-your-own-device initiatives," said Christian Stadlmann, general manager of Europe andsenior vice president of global sales at Aurea. "In order to meet the demands of today's increasing remote workforce and put indispensable mobility solutions into the hands of sales reps worldwide, we're delivering a solution our customers can use on their favorite devices at any time. Aurea CRM.client builds on the offline enablement we've offered for years with Aurea CRM.pad, while providing more power, flexibility and device independence than ever." Aurea Software is the technology behind some of the world's greatest customer and employee experiences, for the largest and most successful brands. Aurea's platform, engagement and vertical solutions help companies create exceptional, end-to-end experiences for their customers – driving both retention and growth. Aurea's family of companies deliver process management, messaging, customer relationship management, email marketing, project and portfolio management, and collaboration software, as well as industry solutions for retail, insurance, energy and life sciences. Aurea is an affiliate of ESW Capital. For more information, visit www.aurea.com or follow @AureaSoftware on Twitter.